A Celiac Walks Into a Bakery . . .
Look, I know it’s dumb to a) walk into a bakery, and b) expect that one of the most famous bakeries in America would be all, “Oh, you bet. EVERYTHING is gluten-free.” But I was waiting on my kid to finish her Saturday morning class and right down that very street was the incredibly delicious La Brea Bakery. And all up in it’s new digs! Not unlike that time I was craving burritos and so I went to the burrito place knowing I could not have them, I just walked on into La Brea Bakery like I owned the place. Which I do not. Perhaps I was buoyed by my last trip into the bakery when it was just a lil’ ol’ bakery and they offered gluten-free macaroons. I thought, well, at least they have one thing I can eat. I was also assuming that even if he laughed at me, the waiter would know what had gluten and what did not. This, I was wrong about. It’s a rare occurrence when I have to explain the gluten biz anymore, as most people have heard of it and its evil ways by now. But my waiter had not. And yes, he did ask if I could have potatoes. (Why is this one of the most asked questions about gluten? I have no idea.) But after explaining, while apologizing for even darkening their lovely door, I did find out that there were a few items I could enjoy. So, heck yeah, I did enjoy. Admittedly, it’s hard to photograph a frittata and have people get excited about it. But that frittata you see above was the best dang frittata I’ve ever had. 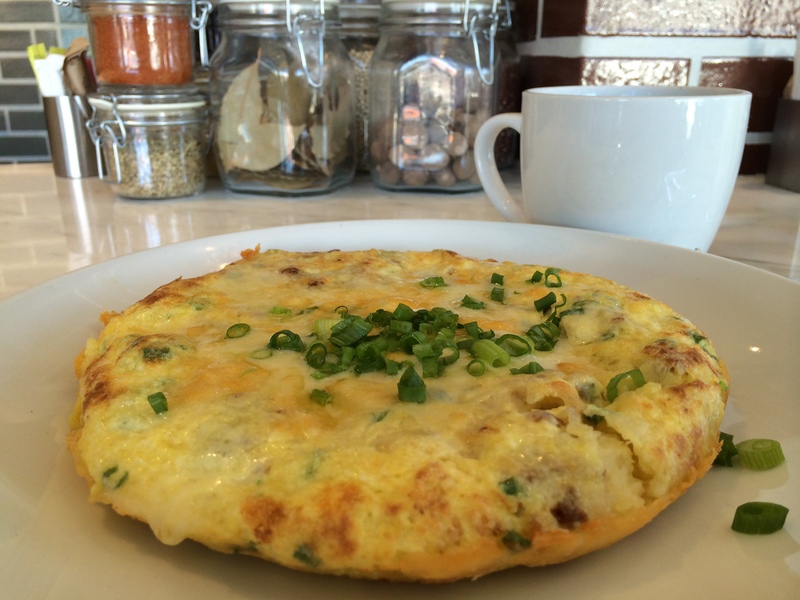 That lovely hunk of yum is the turkey sausage frittata with white cheddar, scallions and shredded potatoes. Yes, it was as big as my head. And yes, I did take the leftovers home in a box. There’s also a braised short rib hash on the menu that is reportedly safe for me to consume. So I will be going back to consume the hell out of it. Tags: gluten free dining, gluten free los angeles, gluten free travel, gluten-free restaurants. Bookmark the permalink. Previous post ← Gluten-Free New York City: Brooklyn, Beacon & The BEST GF JOINT IN MANHATTAN!!! That frittata looks amazing, and I was salivating until you said potatoes. I can’t have potatoes. My body gets very angry and lets me know it doesn’t appreciate ANY gain/potato I consume. It still looks delicious. Potatoes probably gets asked about because the person is confusing gluten free and paleo. Oh, I’d be all over this frittata! Yum. But too bad there were no macaroons. Ummm.. I just frittata’d in my pants I think. Yum! That is a rad story. I don’t get the potato thing either! I’ve been GF for almost a decade, and I can’t tell you how many times people have seen me go for a potato chip, make a baked potato, etc. and they try and stop me.